6 Days Golden Triangle India Tour covers gorgeous places and tourist destinations that ooze out finest aspects of north Indian heritage. Golden Triangle India resonates with finer aspects of incredible India. It can be rightly called as 6 Days Delhi Agra Jaipur Tour, as Delhi, Agra & Jaipur collectively form the nucleus of this dynamic congregation our tour circuit that attracts the enthusiasm of tourists every year. The cities that form this triangle are treasure trove of the best heritage steeped in the wealth of history. Golden Triangle Tours form the deepest link with the soul of India. Golden Triangle India Tour, comprising three most fabulous and historical cities- Delhi, Agra & Jaipur, showcases culture, architectural gems, unique activities and best in-class hospitality. Forts, palaces, inordinately carved temples, world renowned mausoleums, buzzing bazaars, beautiful handicraft items demonstrating exceptional craftsmanship etc enthrall all and sundry. Golden Triangle Trip is the most popular tour of India. The tour begins from the national capital New Delhi, the city of glorious rich past. Delhi maintains a unique balance of past, present and future. With its mention in the epic Mahabharata as Indraprastha, the city has come a long way. The city has to offer the highest minaret made entirely of stones-the Qutub Minar, the resplendent Red Fort with the Indian flag, the martyrs’ memorial India Gate, the House of Parliament with the beautiful long Parliament Street. The Lodhi Garden, Birla Temple, Lotus Temple and Akshardham Temple enchant people with their admirable beauty. Chandani Chowk & Connaught Place are happening markets to visit. The next destination happens to be the city of Agra, which gives India its place in the Seven Wonders of the World. The Taj Mahal is located on the sunny shores of the Yamuna still holding the values of love and respect. Agra is also home to two other UNESCO World Heritage Sites- Fatehpur Sikri and the Agra Fort. Agra is one of the hot spots India tourism. The final destination of Golden Triangle India Tour is the city of Jaipur that evinces the influence of the Rajput warriors in their forts and palaces. Known and recognized as the Pink City, the final destination in the Golden Triangle Tours, Jaipur houses the picturesque Amber Fort, the Hawa Mahal, the Albert Hall Museum, the City Palace and the Jal Mahal. The city offers colorful culture with vibrant music. Watching this city will bring you to the timeline of the kings and queens who ruled over this glorious city. Welcome to India! You will be met by our representative at the arrival hall of the airport in Delhi and transferred to your hotel. Already on the way you get a first impression of the bustling capital. As most of the international flights land mid-night, so have sound sleep to get energized for the next day sightseeing tour of Delhi. After a hearty breakfast, we invite you today to take a sightseeing tour of Old & New Delhi. Old Delhi, once the capital of Islamic India, is a maze of narrow streets and impressive mosques. Visit the monumental Jama Masjid , one of the largest mosques in the world, and go over the historic Chandni Chowk. Red Fort is the next monument to watch. In the Red Fort, visit the marble ornate royal apartments. But, old Delhi tour becomes a fulfilling experience only when you are taken on a manually pulled rickshaw ride to explore narrow alleys and buzzing market place of medieval era. Hereinafter proceed to visit Akshardham Temple (remains closed on Monday). En route visit Raj Ghat , where the Father of the Indian nation, Mahatma Gandhi, was cremated. After Akshardham, drive past the embassy district where you will see the government buildings like President House & Parliament building from a distance and the national monument India Gate. Now, having seen monuments, you will be taken to visit Qutub Minar, a medieval era monument with lot of proofs of Hindu era monuments. Later, in the evening, return to hotel for overnight stay. This morning you will be taken to Agra. On arrival in the historic town, you will be transferred to pre-booked Agra hotel. You will have the opportunity to learn about Agra during a city tour. We will visit the Agra Fort, built of red sandstone, and the Mausoleum of Itimad-ud-Daulah. But the highlight of today’s trip is sunset view of one of the most romantic monuments Taj Mahal from Mehtab Bag. The Taj Mahal, a mausoleum, was built of white marble in the mid-17th century by the Mughal Emperor Shah Jehan in memory of his wife Mumtaz Mahal. Craftsmen from Persia, Turkey, France and Italy, and 20,000 workers had to work 17 years to complete the stately monument in 1652 AD. The Taj Mahal is certainly one of the most impressive buildings and wonders of the modern world (remains closed on Friday). Having explored Agra, return back to hotel for overnight stay. 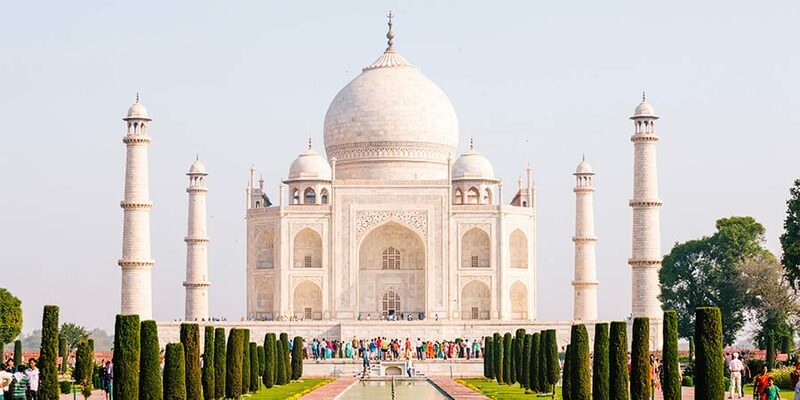 Early in the morning, when in the light of rising sun the Taj Mahal looks most beautiful, you will be taken by Agra tour guide to India’s most visited monument. Spend ample time therein. Take photographs. After watching Taj Mahal, return to your hotel and enjoy breakfast. After breakfast, drive to Jaipur, the capital city of Rajasthan. On the way to Jaipur, stop at the "Ghost Town" Fatehpur Sikri. The grand buildings in the deserted city of Fatehpur are still intact. The city was built in the 16th century but abandoned after only 10 years. See many storey palaces, gardens, a market place and the waterworks. Having visited Fatehpur Sikri, continue on a long journey towards Jaipur. The fast-growing capital of Rajasthan is for the region, both industrial metropolis and cultural center - with a university, theaters, cinemas, museums, a zoo and several historic monuments. On arrival at Jaipur, you will be transferred to the hotel for overnight stay. Have delicious breakfast in the hotel and proceed along with the tour guide for full day sightseeing of Jaipur. The first destination is the Amber Fort, located 11 kms from the city. Amber used to be old state headquarters until 1728. The Amber Fort has private and public halls, a hall of mirrors (Sheesh Mahal), various marble palaces and beautiful examples of old Rajput architecture. Here, you will enjoy a maharaja like elephant ride from the foothills to hilltop, where the main of the fort is located. Further, visit, City Palace, Hawa Mahal (Palace of Winds) & Jantar Mantar. Visit the City Palace , the former royal residence, which houses a museum with an impressive collection of old costumes and weapons, an art gallery with a fine selection of miniature paintings, carpets, royal equipment and rare astronomical works. Then you can also visit the observatory Jantar Mantar, built by Maharaja Jai Sing in the 18th century and is admired even today for its precision. Thereafter visit the Palace of Winds where you shoot photos and to purchase souvenirs. After exploring local market, visit Albert Hall museum and Birla Temple. Later, in the evening, return to hotel for overnight stay. Have breakfast in Jaipur hotel and depart for New Delhi. On arrival at New Delhi, you will be transferred to Indira Gandhi International airport for your onward destination. 6 Days Golden Triangle India Tour ends here.